NOTE: This course is NOT designed to teach students how to replace the role of an experienced BCBA. We STRONGLY recommend that every ABA program be created by, or in conjunction with, experienced, qualified BCBAs. Applied Behavior Analysis (ABA) is proven to have the highest rate of success in treating Autism Spectrum Disorders (ASD). 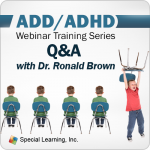 The best way to learn about ABA is to listen to highly trained professionals who have extensive experience and knowledge of the principles and methods of Applied Behavior Analysis. Each session is 1.5 to 2 hours in length. Participants are required to take a 10 question multiple choice pre-test and a 20 question post-test for each session to allow us to assess baseline and information retention. Participants will receive a certificate of completion upon demonstrating mastery (80% pass rate) and completion of a 50-question final exam at the conclusion of the course. You can purchase the course and request a later start date. However, this start date should not be later than 3 months from date of purchase. Financial - Presenters are employees of Step By Step, Special Learning's strategic partner. Presenters and researchers do not receive any financial compensation. Non-Financial - No relevant non-financial relationships exist. 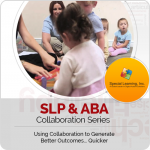 Special Learning, publisher of products for SLPs, BCBAs and other professionals, and Step By Step funded this training webcast. MANDATORY DISCLAIMER: The Behavior Analyst Certification Board (“BACB”) does not sponsor, approve or endorse Special Learning or Step By Step, the materials, information or sessions identified herein.